It’s something your father’s 401(k) couldn’t do: fund a business of your choice. A ROBS plan (Rollovers as Business Start-Up) is an innovative way to fund your own small business using your existing IRA or 401(k) funds. Read on to discover the up sides and dangers of using a 401(k) to kick start a business. Begin doing business free of debt and with good cash flow. Pay yourself a salary from the get-go. Credit history does not factor into this type of funding. IRA funds may be used as a down payment to achieve additional financing such as SBA loans. Family members may be designated as employees of the business, and receive wages from the plan funds. Many people feel they have more control over their ROBS IRAs when compared to traditional IRAs, which are subject to market swings. If properly constructed, a business financing IRA can help you avoid tax penalties for early fund withdrawal. If done incorrectly, you could pay taxes on the money you invest in the business. If you’re less than 59½ years old, you could face penalties for early withdrawal of 401(k) funds. If the business fails, as many start-ups do, you could lose your retirement funds. Even with these risks, many Americans feel they make more over the long term by investing IRA funds in their own small businesses. If you’re in this group, read on to learn how to create a business financing 401(k). 1. Establish a C-Corporation. Get a tax attorney or CPA to help with this. Your advisor should be well-versed in employee benefit law, particularly ERISA (the Employee Retirement Income Security Act). 2. Create a corporate retirement account. To be precise, you’ll need to create a profit-sharing plan that permits all plan assets from rollovers to be invested in company stock. 4. Have the company stock price set through an independent business valuation. 5. Issue all company stock. Then, transfer company stock to the new profit-sharing plan in trade for the cash in the 401(k). 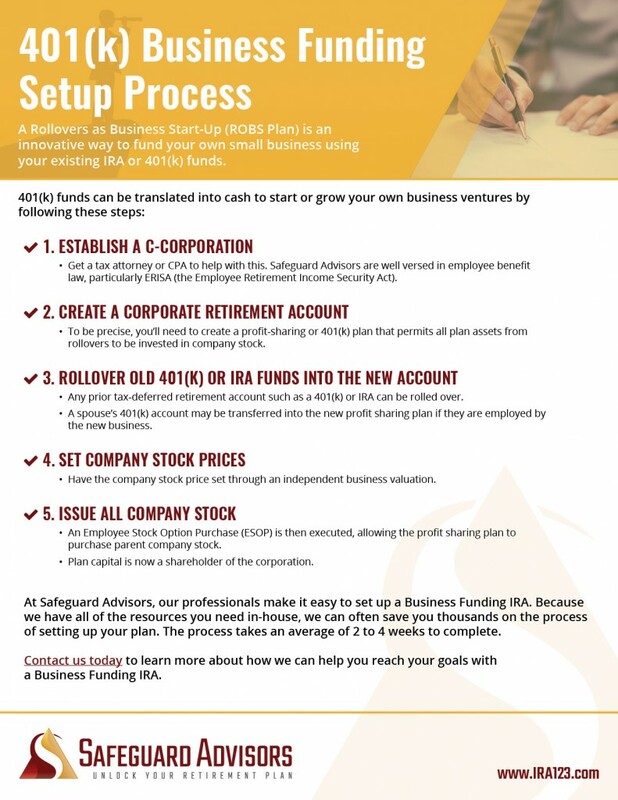 Following these steps, 401(k) funds can be translated into cash for business ventures. Many people choose to buy a proven franchise, which may be considered a more stable investment than an unproven new business. Safeguard’s professionals and consulting attorneys make it easy to set up a Business Funding IRA. Because we have all the resources you need in-house, we can often save you thousands on the process of setting up your Business Funding plan. Overall, the process takes an average of 2 to 4 weeks to complete. Call us today to learn more about how a Business Funding IRA can help you reach your goals.